We have been doing fact checking on & off. But starting September (following the IFCN Flash grant), we have been regular. In October, we did 20 fact checks and in November, we have already published 6. Hence the regularity will be maintained. The current focus is on fact checking the claims made by the central government on their 48-month portal since this is a part of a time-bound IFCN grant and also in the light of ensuing elections in 2019. At the same time, we are putting efforts to fact check claims made by the opposition as well. More such fact checks on the claims made by the opposition will be published in the coming weeks & months. Each source of funding though not specific is listed. There are no other sources of funding other than the ones mentioned. The founding partners of the registered entity are ‘Rakesh Dubbudu’ & ‘Sahitya Reddi’. Audited financial statements will be provided if needed. Corrections policy is already available on this page (https://factly.in/contact/). It has been explained more clearly now. There have been no corrections made apart from two updates. Hence examples could not be provided. Factly has clarified some of the issues raised during the earlier assessment. The signatory has compiled with all criteria quite clearly and can be accepted. As they have received a grant for fact checking in Sept. post this they have been meeting the required number of stories. They have a grant that allows them to focus on the working of the govt. and have agreed to widen the scope of claims they will verify. An email contact is listed. Contact email has been listed. They have clarified this policy. The signatory has compiled with all criteria quite clearly and can be accepted subject to edits. The website is a private digital network and has started fact checking regularly over the last month or so. The earlier months are more sketchy. The fact checks are mostly limited to government claims. Could include other sources or explain why they chose to check just the government. Details of funding are not clearly defined. Team members are clearly listed and there is a form for readers to contact the organisation. This process can be made easier. The website explains its fact checking methodology. It has no clear corrections policy. This could be rectified. 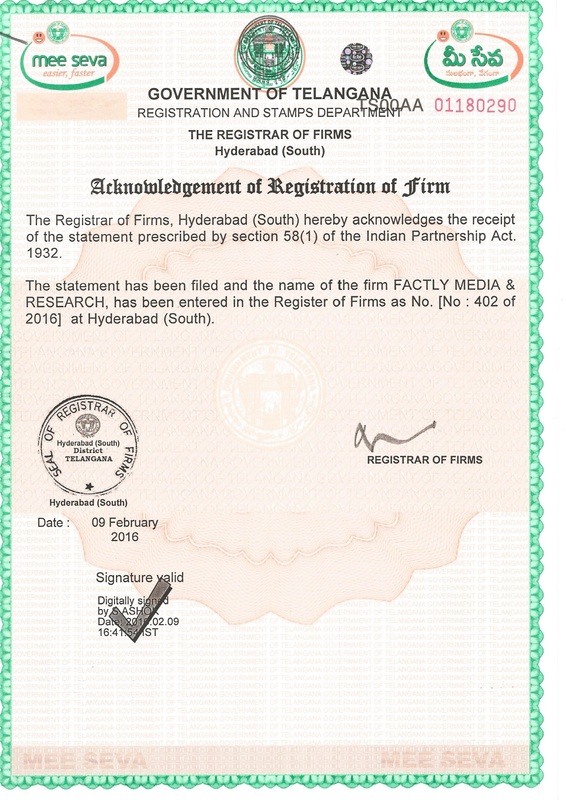 Factly, registered as Factly Media & Research is a partnership firm and has been in existence since 2016. Factly has a dedicated Fact Checking project that can be accessed from the main menu on the website. The company is registered under the partnership act. The site says it is set they use govt data to verify claims. done_all 1a marked as Fully compliant by Surekha Deepak. Factly regularly does fact-checks, but limit ourselves to claims made by politicians or any claims made on government rules or policies. All our fact-check articles are available on a dedicated link that can be accessed from the main menu of the organization’s website. The articles are listed by date of publishing. Factly is also the recipient of the APAC Flash grant of the International Fact Checking Network (IFCN) (https://www.poynter.org/international-fact-checking-network-flash-grant-apac) for a dedicated fact checking project for verifying claims made by the current government in India. Oct has around 20, Sept has 6 and Aug has 1. The stories have become more regular only from October. Too soon to say it is compliant over 3 months. done 1b marked as Partially compliant by Surekha Deepak. We consistently make efforts to fact-check claims which are made by the government or the major politicians and also claims made in general on government rules or policies. We have also committed to do 100 such fact-checks on claims and counter claims made by the current government in India and the opposition parties respectively in the next few months, which is funded by IFCN as part of the APAC Flash grant. We have a detailed methodology that is followed meticulously followed for every fact check. The sources for fact check are limited only to official government sources and each of the source/evidence is hyperlinked and attached in the fact check. The rating methodology is also more or less standardized. To fact-check claims and represent data is easily understandable formats, we use charts, comparison and graphs etc. The methodology & sources are consistent across all our articles on diverse claims. As most of the fact checking comes from a single surce. Factly could explain why they have chosen to concentrate on the government's website. And also how this will be done in an impartial manner. done 2a marked as Partially compliant by Surekha Deepak. Every employee of Factly is briefed at the time of joining about our nonpartisanship policy. The following paragraph is part of the offer letter of employees. As an organization, we remain committed to objectivity and nonpartisanship. Our Fact Checks do not contain opinions of any sort, but simply state facts. We also ensure that anyone being recruited into fact-check team does not have any affiliation with political parties and advocacy organizations. Potential employees are asked to remain objective and not have any affiliations. The offer letter includes a paragraph stating they are non-partisan. done_all 2b marked as Fully compliant by Surekha Deepak. Each & every Fact Check story contain hyperlinks to public (government) data sources or links to documents obtained under the Right to Information (RTI) Legislation. As a policy, Factly uses only public (government) data/information for the purpose of fact checking. We do not use data/information from any private source (except for global & respected multilateral organizations). The claim source is also hyperlinked (like a press release, relevant government website, relevant social media message, news story, video etc). We also reach out to relevant government officials, public representatives etc. if there is a need. These sources are adequate for any reader to fact check the claim themselves. Most key sources are linked, Often the links are to the official reports, and the responses by ministers in the houses of parliament. done_all 3a marked as Fully compliant by Surekha Deepak. Factly is a registered for-profit organization & the Fact Checking project is part of this for-profit entity. Our current sources of funding include the following. Each source of funding is not listed, but the website does tell us it is a ‘for proft’ organisation. With funding from it’s founders. No names are mentioned. Additional funding from consulting and grants, and reader subscription, with no details. Stories do have a disclosure that they are part of the project funded by a flash grant by the IFCN. There are no details of spending. done 4a marked as Partially compliant by Surekha Deepak. done_all 4b marked as Fully compliant by Surekha Deepak. Contact address is listed. The only way to contact them for complaints or comments is through a form on the site. No email or other ways of contacting them. done 4c marked as Partially compliant by Surekha Deepak. done_all 5a marked as Fully compliant by Surekha Deepak. Ask readers to fill the form if they would like any information fact checked. But not much else. done 5b marked as Partially compliant by Surekha Deepak. They say they have not had to correct any stories only updates. There is no corrections policy. done 6a marked as Partially compliant by Surekha Deepak. They say they have not had to correct any stories only updates. There is no corrections policy. Only two updates. done 6b marked as Partially compliant by Surekha Deepak.